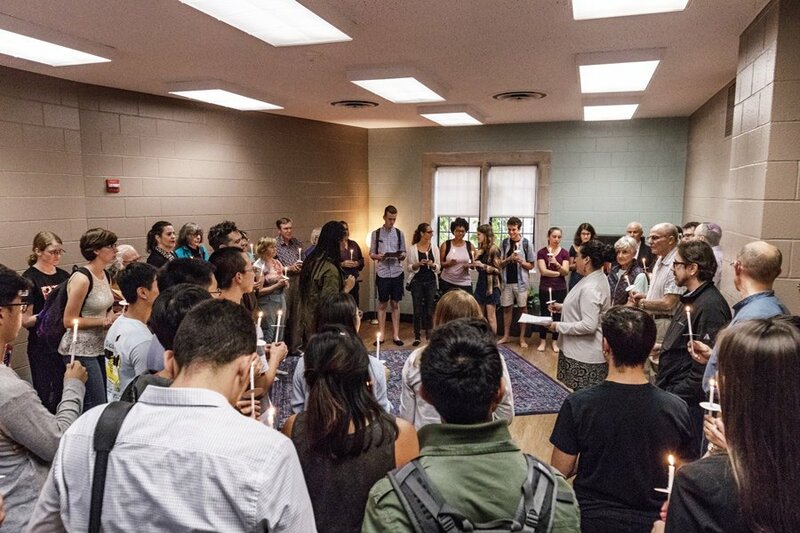 Students gather in the new Multi-Belief Space in Parkes Hall, which was created to provide a safe environment to practice all religions. The space was unveiled at Tuesday’s annual Fall Faith Fest. Students of all faiths attended the dedication of the new Multi-Belief Space, unveiled Tuesday in Parkes Hall as part of the Fall Faith Fest. The purpose of the new facility is to establish an interfaith space for students, said Eric Budzynski, associate for religious life and chapel music at Northwestern. The Fall Faith Fest is an annual event held by the Office of Religious and Spiritual Life to celebrate all faiths on campus. The Multi-Belief Space, located on the second floor of Parkes Hall, is intended to provide a safe environment for students to practice all religions, Budzynski said. “This space not only gives recognition to the diversity and abundance of our religious and spiritual life here on this campus, but also offers us a goal: to continue to evolve,” he said. University President Morton Schapiro and vice president for student affairs Patricia Telles-Irvin cut the ribbon across the doorway to officially open the new room. Inside the Multi-Belief Space, representatives of Christian, Jewish, Muslim and Buddhist communities blessed the opening of the new facility. Weinberg senior Taylor Shelton said she felt the new Multi-Belief Space was a great addition to the religious and spiritual community. Representatives of NU’s Native American community also spoke at the unveiling. After the unveiling, Schapiro addressed attendees during opening remarks of the Fall Faith Fest. He said many graduating students find religious and spiritual life on campus to be important throughout their college experience. He added that students can often find support through these organizations. Attendees also observed a moment of silence for the victims of Sunday’s mass shooting in Las Vegas. At Tuesday’s event, eight students were recognized for their involvement in the Northwestern religious and spiritual community and received one-year-old bonsai trees for their efforts. Schapiro and Telles-Irvin were also recognized for their contributions to spiritual life on campus and received bonsai trees. Among those in attendance was Bienen junior Johnathan Orr, a member of Asian-American InterVarsity — a group that holds morning prayer meetings. Orr said he was interested in finding out more about the Multi-Belief Space and using it with his group.